In our last post we talked about ,” Turning the Heat off While on Vacation”. Frozen pipes can occur when you turn the heat down and it gets too cold outside causing potential frozen pipes as shown in this picture. If you have uninsulated water pipes on the outside wall you risk these pipes freezing in cold weather, however they can also occur for many other reasons as well. Many new homes have fresh air intakes that are required for today’s HVAC systems. If this fresh air intake is too close to any of your water pipes , they can freeze during very cold weather. By redirecting the make-up air inlet down to the floor, you can provide some pipe freezing protection. 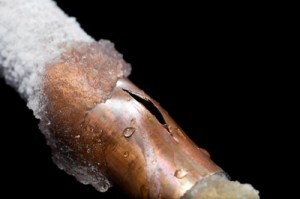 Frozen Pipes can cause thousands of dollars in damage, from leaking water once they thaw out , not to mention the frustration of not having running water due to frozen pipes. Many of the northern states and all of Canada can have very cold weather during the winter, so if you do not pay attention to this issue of potentially freezing pipes you can have a huge expensive problem on your hands. If the pipes are already frozen and leaking you need to shut the main water valve off to prevent additional water leaking from the pipes. If the pipes have not yet frozen, but are in danger of freezing make sure you know were the shut off valve is and have the name of a plumber you can call if there is a leak unless you can fix this problem yourself. Remove all of your possessions that could get wet from the area to avoid any damage to them if there is a leak from the pipe bursting under the pressure of the ice in the pipes. Next you need to deal with this fresh air vent. Do not plug this vent since that is what is providing you with fresh air in your home and avoids all kinds of issues including carbon monoxide build up in your home. This fresh-air intake pipe is mission critical in today’s newer homes. It provides makeup air for ventilation fans, combustion air for some appliances, and it may be providing air for a traditional masonry fireplace. Without a make-up air or fresh-air intake, you can have dangerous back drafting of exhaust gases from your fuel-burning appliances. Whatever you do, don’t block this mission-critical pipe. Direct the air coming from the intake away from your water pipes. You may have to move the pipe or even add an extension on to it to take the air away from the vicinity of the water pipes. Even a deflector to deflect the cold air away from the pipes as it enters your home, will help in an emergency. You can now start to thaw the frozen pipes. Do not use a torch. You can place damp towels in a microwave oven and heat them up just like flight attendants do for all those pampered passengers who fly first class on airplanes. Wrap the pipes with these steaming hot towels to start thawing the frozen pipes. It will probably take repeated heating in the microwave for the towels to thaw the pipes. Another approach is to place an electric space heater in the room were the pipes are frozen and warm up that room. This will take some time as well, but will gradually relieve the pressure on the pipes. Combining the hot towels and the space heater may make this a quicker job. Consumers have also use hair dryers with the blower directed at the frozen pipe to thaw them out. Remember once the water begins to flow the water will melt the rest of the ice in the pipe. Unless you provide some kind of permanent solution to this problem, it is quite likely that you will have frozen pipes again the next time it gets really cold outside. Some people have been forced to let the water run at a trickle so that there is always water moving in the pipes to keep them from freezing. This is a good short term solution, but not a long term one. Comments are welcome. Any comments that help our readers with this issue will be appreciated and displayed on this post.